In the early 1990s, there was renewed interest in how best to reconcile the economic imperative for new development within historic towns with the preservation and good management of the important archaeological remains which play such a crucial part in making these places so special. English Heritage therefore decided to commission a series of studies concerned with the archaeology of the most important historic towns in England. Their purpose was both to present an up-to-date account of what was known about these places, and also to help formulate strategies for managing the archaeological implications of development proposals. 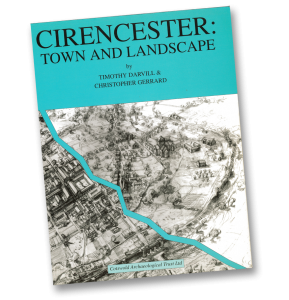 Cirencester was in the first wave of these new urban archaeological assessments and in 1994 was the first one to be published. Cirencester Town and Landscape was both ground-breaking and an important feather in the cap of Cotswold Archaeology. It showcased not only our expertise in the highly complex discipline of urban archaeology but also our ability to produce a high-quality publication in a short period of time. It is telling that 20 years later some other assessment reports are only just appearing or are still awaited! The book was concerned with the whole history of Cirencester and its immediate environs, from early prehistory right up to the 19th century. The medieval and post-medieval periods in Cirencester are less well known or researched than the Roman town of Corinium Dobunnorum, yet the extant buildings of these later periods contribute significantly to the character of this quintessential Cotswold market town. It was a measure of the interest in the publication that it quickly sold out, a rarity indeed for archaeological books, but is now available as a free pdf download.